Edward Paquette Sr. born in 1858 was the son of Joseph Paquette and Felicity Meldrum of St. Clair County, Michigan. On July 11, 1881, at the Immaculate Conception Church in Anchorville, Fr. H.H. Meuffels married Edward Paquette to Miss Anna Chartran. Anna was born in 1862 to the parents of Charles Chartran and Virginia Loiselle. Edward and Anna had four children: Emma, Elizabeth, Henrietta "Hattie", and Edward Jr. "Edmund." Edward Sr. was a sailor on the Great Lakes. 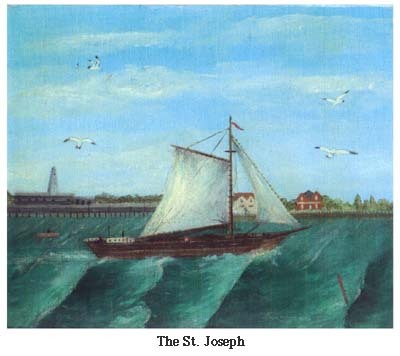 He sailed with his brother-in-law, Captain Joseph Chartran, and his uncle, Mate Timothy Paquette, aboard the U.S. Scow St. Joseph. The "St. Joe" was a 150 ton wooden spoon bowed schooner built in 1864 and owned by Matthew Sicken of Marine City, Michigan. During a storm on Lake Huron, August 18, 1890, Edward went to help the men take in the sails and was thrown overboard by a huge wave that washed over the boat. The "St. Joe" stayed around in the storm for five hours in the hopes of finding and rescuing Edward. They finally gave up and went into Port Huron to report the accident. His body was never recovered. Matt Sicken, owner of the "St. Joe" gave all the lumber and materials to build a small home for Edward's widow, Anna, and her four children. Relatives and neighbors did the work without pay. That house still stands in Marine City, at 249 Hill St. The house number has since been changed to 413 Hill St. Anna and the children lived there about five years when she became ill and died in 1895. Captain Joseph Chartran and his wife, Agnes Mayville/Mainville, took the children into their home. Anna Chartran Paquette had another uncle named William Chartran. It was said that during the Civil War William did not want to go and fight so he fled on foot, with a small valise across the St. Clair River when it was partially frozen and full of ice chunks. He came ashore at Sombra, Ontario, Canada and settled somewhere in the vicinity.